Lucky for you, we’re giving you the chance to fill your last Monday in January with new business opportunities to put on your radar. This week’s #EDGEucation report focuses on four actionable stories that will keep you and your team a step before competitors. Our WinmoEdge team of experts works tirelessly to put prospects in front of you first. Everyone is reacting to the same industry news, and our WinmoEdge insight will make sure you know how, when and what to pitch before anyone else. The accuracy of our information comes from cold, hard data and an in-house research team that verifies key decision maker contacts every 120 days. To give you a taste of the magic, here are four new business opportunities to finish your month strong. As always, if these stories are helpful for you and your team, request a Winmo trial today for more just like them. Ab InBev finished up their spiked seltzer rebrand just in time for the Super Bowl, now referred to as Bon & Viv Spiked Seltzer. The rebrand included new packaging, more flavors, and a switch to less alcohol catering to reports that determined younger generations aren’t drinking as much. The first seltzer on the market will appear in a Super Bowl ad in an attempt to attract a younger demographic and get the word out on the rebrand progress so far. Their demographic is slightly female-skewed, and spend is typically highest in the spring and summer pairing with the warmer weather. When pitching, keep in mind the brand is competing with countless others for millennial attention. iSpot reports national TV spend totaling $3.8 million over a five-month period in 2018. While Adbeat does not currently have digital display data, the brand definitely uses digital to some extent and is expected to also work through experiential and sponsorship channels. Competition will include creative agencies such as Praytell, Deutsch, and Blue Marlin to name a few. Also, look out for media agency since 2017 360i. A female focus on pitches is key, and come prepared with ways to incorporate the brand’s new commercial strategy. Another CMO shift, another agency review. You know the drill. Carestream Dental found the CMO they have been searching for because they named Greg Marko global chief marketing officer, effective January. His background includes a most recent position as global key accounts and category development head at Johnson & Johnson Vision. Jeffrey Farm also moved into the director of marketing and business development position in October to add to the mix up in leadership. These changes shift Carestream to a predicted agency review within the next 9-12 months potentially. When pitching, be sure to focus on increasing awareness throughout the dental community. The company typically uses digital and social. With spend going up, those with high ROI should reach out and be ready to target decision makers in the dental realm, mostly around the Atlanta HQ. Procter & Gamble is currently going through a period of testing and trials. To start, its agency model is being tested, which recently saw Dentsu’s Carat and the in-house team receive a larger portion of media. As part of this agency testing, P&G is also giving its brands the choice to take operational work, planning, digital buying, search and programmatic in-house. We’ll keep you updated on any reports signaling a P&G brand taking any of these accounts in-house. 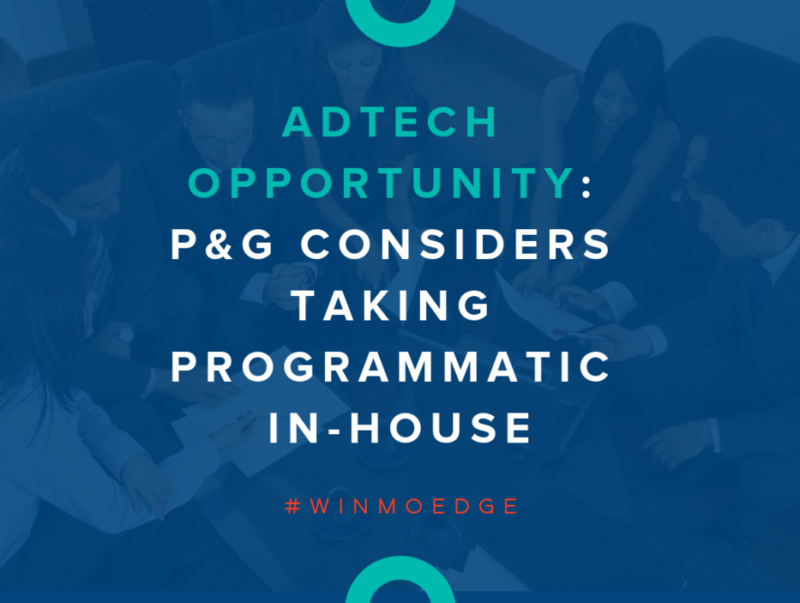 P&G historically brought work in-house to cut costs and improve efficiency. While its likely more work will be taken in this direction, keep in mind in-house can be extremely costly and time-consuming. Typical spending spikes occur in H2, and specific increases have gone to TV and radio in recent months. TV spend is expected to remain the focus throughout the year, and be sure to target women and moms who serve as the brand’s main demographic. After being acquired by Focus Brands last year, Jamba Juice named Geoff Henry its president, effective January. His background includes holding Coca-Cola positions such as VP of Marketing and senior brand manager. Along with naming a president, Shivram Vaideeswaran was also named CMO, effective January. With experience as CMO at Blaze Pizza, Vaideeswaran brings restaurant industry knowledge to the company. The roster changes were completed with the promotion of operations director Jaime Denney to operations VP. The brand’s typical planning and buying periods are Q2 and Q3, investing in broadcast, digital and print. The target demographic better-for-you consumers with a slight female skew. Although overall spend has declined, look for a rise with the new CMO and a potential shift in strategy as well. With all of the change happening with this brand, reach out soon for work. Signs of an agency review are present, with one expected 6-9 months from now according to our team of WinmoEdge experts.